Romance fiction has frequently been described as nothing more than mindless, escapist, entertainment but it is a truth increasingly acknowledged that "popular culture is far more than an escape from everyday life, a brief respite from the reality in which ‘the political’ traditionally takes place" (Duncombe and Bleiker 36-7): it can, for instance, "both entrench and challenge prevailing identities" (37). The ways in which this is so are probably more apparent in some texts than others, and an individual reader's identities may also make them more or less aware of which identities are being challenged or entrenched. US identity, then, is defined as combining extreme individualism with community living. [I discuss community in Chapter 4 of Pursuing Happiness.] It also involves hard work (as I discuss in Chapter 2 of Pursuing Happiness). US identity would also seem to be expressed more via some locations than others. [In Chapter 3 of Pursuing Happiness I focus on the US West.] Although romance novels have been set all over the US, some locations or types of locations do seem to be favoured over others. There are, for example, a lot of US romance novels set in small towns and I can't help but wonder if that's because some of the authors, like Sarah Palin, think that "the best of America is in these small towns that we get to visit, and in these wonderful little pockets of what I call the real America" (Leibovich). "[...] everything seems so big, so untamable you wonder how people can believe they're really in control of it all." His smile was gentle and softened the harsh lines of his face. "There's nothing like a Texas prairie to do that for you. Can you imagine how the first people to cross this great expanse felt?" Rama grinned at him. "Talk about intimidation!" She chuckled. "It's a good thing I was born in the twentieth century. I don't know if I would have had the courage to leave family and home to go off into something so unknown." while it's possible that Ferrell described "the American plain" as the "heart of America" merely as a way to indicate its geographical position between the two coasts, I get a sense that it is deemed to be the "heart" because it is from here that the ideological lifeblood of the US, embodied in rodeo and a White-centric vision of US history, is pumped to other parts of the US. Britten, Thomas A. "Native Americans in West Texas." West Texas: A History of the Giant Side of the State. Ed. Paul H. Carlson and Bruce A. Glasrud. Norman: U of Oklahoma P, 2014. 91-106. Ferrell, Olivia. High Rider. New York: Silhouette, 1987. Leibovich, Mark. "Palin Visits a ‘Pro-America’ Kind of Town." The Caucus: The Politics and Government blog of the New York Times. 17 October 2008. 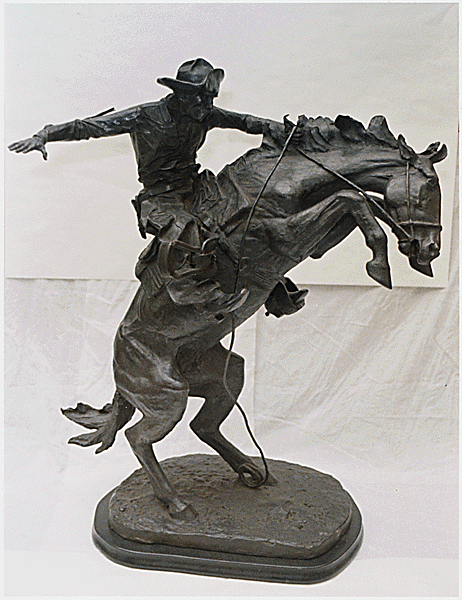 Statue by Frederic Remington - The Bronco Buster. Licenced under Public Domain via Wikimedia Commons.